The lake is not just for summer. Enjoy ice fishing, snow mobiling, downhill and cross country skiing, Oxford Casino (less than 5 miles) and simple relaxing. Beautiful lake views from the 2nd floor deck or watch the sunset from the waterside. Sun hits the sandy shore most of the day. In summer, the gradual water entry is perfect for small children. Take out the row boat or kayaks and explore the nature filled shoreline. Bring your own motor boat or rent one from the local marina. A mooring ball and dock are available for your use. Travel across the lake by boat to the Outpost where you can buy basic groceries, fresh baked muffins, takeout pizza, and ice cream. The walkout basement/gameroom is a great place for the whole family. Indoor and outdoor games are included. 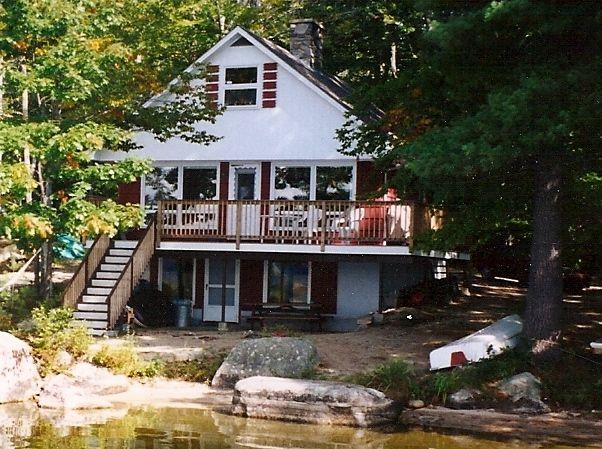 We are asking renters to leave the cottage as they found it. All items put away in their proper place and light cleaning, including wiping down of surfaces and bathroom, vacuuming, and sweeping outdoor deck. We really enjoyed our stay in "Duck Inn"! The house was very welcoming and clean upon arrival. The location was beautiful! The little beach area was perfect for our kids, as were the steps into the lake. There is a perfect swimming area for little kids, and our three year old loved it! The hammock over the rocks was one of our favorite places, along with the deck. The house had all the needed amenities, and we were pleasantly surprised by the dishwasher! The only thing we could have wished for was a little more privacy, as the neighbors are very close but VERY friendly! We would highly recommend this home to anyone looking for a place to stay on Lake Thompson and we hope to be able to get back! Thank you for opportunity to stay! We had an incredible time on Thompson Lake!! The house was super clean, nothing fancy but had everything we needed. We would definitely stay here again. The lake was pristine, kayaks were lots of fun and the dock was great for jumping right into the lake! The house is situated so that there is a small cove which was great for my 11 year old to learn how to navigate the kayaks and by the end of the week he went out with my husband for about an hour just cruising around the lake. We rented a boat for 2 days from the local marina and went water tubing...such a blast. I would definitely recommend this house for a vacation in Maine! Great setting and Amazing Sunsets!! What a great time we had on Thompson Lake. The cottage was clean and organized. On a small protected cove it was easy to launch the kayaks. Facing west, the sunsets were not to be missed. Fishing, boating, nearby golf or just relaxing I would recommend this spot to my family, friends, or anyone wanting to get away and enjoy being on the lake. We are looking forward to a return visit. Clean and comfortable! Great for kids and couples! Our family had a fantastic week at this camp! Our 5 children are ages 1-8. There is a really nice shallow area to swim, even for the little ones but gradually gets deeper the further in you go. They also have a nice long dock that the kids can swim off of. Kayaks were available to use. We swam, kayaked,and fished off the dock. The kids were thrilled! The lake is large with good fishing that my husband really enjoyed! The house is also well stocked. 3 nice bedrooms plus added additional space upstairs for sleeping and additional space in the basement. The kitchen & livingroom overlook the lake and they are both a good size! Additional games and toys were in the basement that came in handy for kids. There is a nice outside deck and grill. Everything was in good condition. It was a comfortable stay. The lake itself has many boat rentals available which is a good option if you don't have a boat. There are several stores within 10 - 15 minutes. Overall we were very satisfied and plan on coming back again! 45 min to Portland, 60 min to Freeport, 20 min to Bridgeton. This Lakefront Cottage on the East Shore of Pristine Thompson Lake in Oxford, Maine offers the perfect place to relax and unwind. Most of the fun will be out and around the lake. Swim in crystal clear spring fed water, boat, water ski, tube, or wakeboard....whatever your pleasure. The deep waters also offer excellent fishing. If you want to leave the lake (which you probably won't), you can go to the Oxford Speedway and see real racing or the associated Fun Park where you can play mini-golf or go go-carting (only a 10 minute drive). Premium Outlet shopping is available in Freeport only 60 minutes away. Portland is a 45 minute drive where you can go to art museums, whale watch, eat in great restaurants, browse the many seaside shops or see the Portland Sea Dogs (baseball) . Just south of Portland is a water and amusement park. There are also many fairs and festivals that occur throughout the summer and fall months.